The duet And here we meet is linked to Alexandra Waierstall's latest work A CITY SEEKING ITS BODIES (2015) in collaboration with the composer and pianist HAUSCHKA as well as an outlook of their upcoming work premiering November 2016 at tanzhaus nrw. 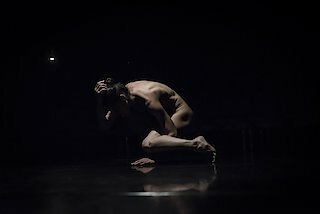 With her distinctive choreographic voice characterised by her sensitivity and musicality she again delves into the topics of ghost towns, no man's land and forgotten territories. She creates new relations between presence and absence as well as between language, movement and space.